On our way to Pangasinan for a vacation last November 2007, we passed by Isdaan, a theme restaurant in Gerona, Tarlac for lunch. 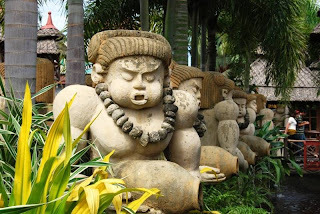 The restaurant grounds is full of big statues influenced by Southeast Asian culture. The restaurant have these "kubos" or nipa huts with large tables. This is where friends or families sit down to order and eat. The huts are literally floating above the fish pens. While you are eating, you may be approached by an entertainer who would either sing, dance or do both for you at your pleasure. But this is not just any other restaurants. People go here not only for food but also for "entertainment". They have other activities that will earn you a kilo of fish to eat by simply participating. One of which is singing in their stage which Julie did. For the most adventurous people and for barkadas, you may also take the challenge of holding a pail and crossing a narrow pathway back and forth with the risk of getting wet. For doing this you can earn another kilo of fish. After eating, there are other activities you can do around the restaurant. One is Tacsiyapo - a known attraction of Isdaan. It's a wall written with all type of negative emotions and personalities for you to release your tension and anger. You usually buy plates, cup, saucers, vases or even televisions to throw to the wall, aiming at the bad habit or personality you hated most. Traditionally, you think of something or someone first, shout "Tacsiyapo!" and throw the item. So this is me throwing a plate in the wall after shouting "Tacsiyapo!". Kids can also ride on goats or rams like these one around the grounds of the restaurant. And because the place is like a glorified fish pen, you can also feed the fishes (just ask the waiter for the fish foods) or do fishing (for a fee). This is a picture of my whole family. The restaurant is in the list of my "must-try" to go and experience. In fact, most people come here more for the experience rather than food though they serve good Filipino dishes here. With so much things to do and on the way to the beaches of Pangasinan or the cool city of Baguio, it is important that if you drop by here to keep in mind that you might be late going to your destination! Thanks for the tip, bro!